According to a National Chicken Council report released Friday, 1.25 billion wings will be consumed during Super Bowl XLIX. 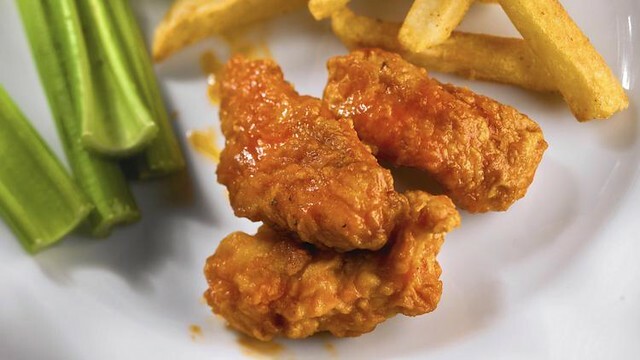 The average wholesale price of chicken wings is currently $1.71 per pound, up from $1.35 per pound at the same time last year, according to the Daily Northeast Broiler/Fryer Report by the U.S. Department of Agriculture’s Agriculture Marketing Service. Wing prices hit a record high in January 2013 of $2.11 per pound. If one laid 1.25 billion wings end-to-end, assuming and average length of 3.5 inches, they would stretch to and from CenturyLink Field in Seattle to Gillette Stadium in Foxborough, Mass., almost 28 times. The wings would also circle the Grand Canyon 120 times. It’s enough wings to put 572 on every seat in all 32 NFL stadiums and they weigh about 5,955 times more than the poundage of the Seahawks and Patriots entire 52-man rosters combined. Most people will buy wings from restaurants and bars, but wings sales at grocery stores also spike during Super Bowl week. Nielsen Perishables Group FreshFacts shows that fresh and prepared wings sales totaled $1.7 billion in the 52 weeks ending Nov. 29, 2014, an increase of 3.1 percent compared to a year earlier. As far as dipping sauces go, Ranch wins out. More than half of people prefer ranch for dipping, while 42 percent prefer barbecue sauce and 36 percent prefer blue cheese. As we wonder how half-time turned into the fair-ground joke that it has, we might recall that it was on this date in 1890 that journalist Nellie Bly completed her 72-day trip around the world. In 1888, Bly suggested to her editor at the New York World that she take a trip around the world, attempting to turn the fictional Around the World in Eighty Days into fact for the first time. A year later, at 9:40 a.m. on November 14, 1889, with two days’ notice, she boarded the steamer Augusta Victoria, and began her 24,899-mile journey. She brought with her the dress she was wearing, a sturdy overcoat, several changes of underwear, and a small travel bag carrying her toiletry essentials. She carried most of her money (£200 in English bank notes and gold in total as well as some American currency) in a bag tied around her neck. Bly traveled through England, France (where she met Jules Verne in Amiens), Brindisi, the Suez Canal, Colombo (Ceylon), the Straits Settlements of Penang and Singapore, Hong Kong, and Japan. 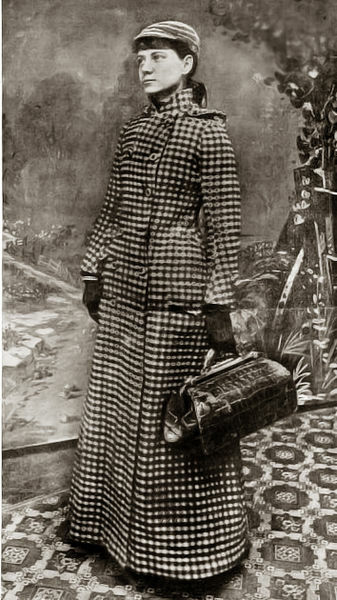 Just over seventy-two days after her departure from Hoboken, having used steamships and existing railway lines, Bly was back in New York; she beat Phileas Fogg’s time by almost 8 days.